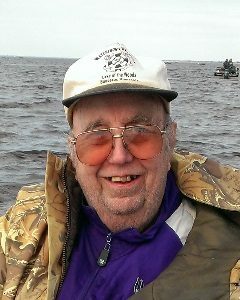 LeRoy A. Schmidt, age 89, of Baudette, formerly of Hutchinson, Minnesota, passed away on September 4, 2018, at Sanford Medical Center in Bemidji, Minnesota. Funeral Services will be held on Saturday, September 8, 2018 at 11:00 A.M. at Dobratz-Hantge Funeral Chapel with interment in the High Island Cemetery in New Auburn, Minnesota. Visitation will be held on Friday, September 7, 2018, from 5:00- 8:00 P.M. at the Dobratz-Hantge Funeral Chapel and will continue one hour prior to the service at the chapel. LeRoy Schmidt was born in 1929, in Bloomer, Wisconsin. He was the son of Roy and Gladys Schmidt and was baptized and confirmed in his faith. He received his education in Bloomer and was a graduate of the Bloomer High School. He furthered his education by attending Minnesota School of Business. LeRoy entered active military service in the Army Air Corps in 1947 and while he was in basic training, the United States Airforce was established at Fort Sheridan, Illinois, and he was transferred into the Air Force. He served his country as a member of the 56th Motor Vehicle Squadron at Selfridge Air Force Base in Michigan during Peacetime. He was also stationed in Central America from 1947-1950. He received an Honorable Discharge in 1950, and achieved the rank of Corporal. LeRoy was united in marriage to Harriet at Peace Lutheran Church in Hutchinson, Minnesota. This marriage was blessed with 7 children, Paul, Gary, Roger, David, Bruce, Sara and Dale. LeRoy and Harriet resided in Hutchinson, Minnesota, and after retirement wintered in Scottsdale, Arizona, before moving to Montgomery, Minnesota in 1994. They shared 61 years of marriage until Harriet passed away in 2013. After his beloved wife died, LeRoy moved with his son, Paul to Baudette, Minnesota. LeRoy enjoyed fishing, camping, bowling, traveling with his wife through the US, working on Sudoku puzzles, jigsaw puzzles, and playing cards. LeRoy especially enjoyed the time he spent with his children, grandchildren, and great grandchildren. LeRoy passed away on Tuesday, September 4, 2018, at the Sanford Medical Center in Bemidji, Minnesota at the age of 89 years. Nieces, Nephews, many other relatives and friends. I am so sorry to hear about LeRoy. It is so hard to lose a parent. I have a lot of memories of your family on Huron St. and think of you all so often! Hold tight to all the wonderful memories of Harriet and LeRoy! Love you all. ?? Our hearts go out to you all as you say “Goodbye, til we meet again”. My heart goes out to Paul and the family. Paul, Leroy, and Harriet were like family to me. I will be unable to attend, but will be thinking of all of you in the family! My sympathy and hugs! So sorry for your loss! Sending sympathies. I am deeply saddened by the news of the loss of your Dad. I pray that God will grant you the strength. My most sincere condolences. Paul and Family, LeRoy was one of kind. It was a bright spot in my day when Harriet and LeRoy would stop for a visit. He taught me many things about life and work. LeRoy had talent that is missed today. I was so glad to hear that camper creation made it to Baudette. Sorry for your loss, my thoughts and prayers are with you. When Bruce texted me about Leroy’s passing it flooded me with so many wonderful memories I have spending time with you guys as kids growing up, and with that, getting to know your parents, Leroy & Harriet…I treasured them both. To me it was so cool that Leroy delivered milk to people’s homes…and, of course, to the A&W and Country Kitchen because they only used the best products! And Harriet made the best malts in town at their ice cream shop next to their laundromat. It’s the passing of a great generation before our eyes…while our parents were neither celebrities nor wealthy nor perfect…they were great in that they got us to church, they provided for our needs as children, and they honored the gift of work…basic adulting of that era…all four of our parents did those little things which made America great back then. Thank you Paul for looking after them all these years. Blessings to each of you on your family reunion, which, funerals ultimately are for the surviving family members. May the God of heaven and our Lord and Savior Jesus Christ bring you hope and peace and comfort.